We’re so excited that the New Year also brought us expecting grandkids... kind of ;-) This past Sunday we took in a young, scared little Mixed Breed, we named her Coconut, who appeared to be expecting puppies. She was found as a stray in rural OH and went unclaimed. While in the shelter she started to show signs of pregnancy, although there was no veterinarian there to confirm. We took her to our veterinarian this week and they confirmed not only that she’s pregnant, she’s due soon! Unfortunately we don’t know date on conception or what kind of dog dad was, so we’re on our toes to meet this mystery puppies! Since she’s been with us we’ve been showering her with kisses, love, & treats. Her first day she was so scared she wouldn’t even take a treat from us, but now she thoroughly enjoys her treats and even gives us great face kisses. While this will be Coconut’s final litter (she will be spayed prior to finding her forever home), we couldn’t help but celebrate her beauty by having a maternity shoot for her. Who would’ve thought that a little stray dog with seemingly no hope would rock a floral crown and necklace. THAT is the power of rescue! Flea & Tick Season is (Unfortunately) Here! Seresto Collar - We love these! While most flea collars do not work, these are worth every.single.penny! Made by Bayer, these last 8 months straight, and can even get wet. They are also able to be kept on during your dog's DayCare or Boarding stay with us. Seresto Collars are made for large dogs, small dogs, even cats! Vet's Best Yard Spray - It's important to treat your yard, even if you don't already have a flea or tick problem. Deer, rabbits, squirrels could drop fleas in your yard, then being picked up by your dog or cat. We love Vet's Best because it's natural, plant based, and you can just hook it up to your hose and you're good to go! Safari Flea Comb - A flea comb is a really important tool to have in your pet supplies kit. A great time to flea comb your pet is when they laying on the couch or their bed in the evening, they will enjoy the light brushing and you'll be checking to make sure their skin & fur is clear. We chose this flea comb over others because it has a really nice handle and is well made. Capstar - Available for small dogs & cats, along with large dogs, Capstar is a quick solution to your flea problem. Capstar is a small pill you give your pet, and over the following 24 hours the Capstar kills every flea that bites into your pet. While Capstar will not kill eggs, or fleas that don't bite in that time frame, it will help you contain your problem until you can get them in to us for a flea bath. As always, check with your vet before giving any pills to your pet that you have never given them before. Vet's Best Home Spray - We really love how natural Vet's Best is! It's safe enough to be used on bedding, furniture, carpets, & rugs. It's even made in the USA! These are our favorite flea & tick products. Some are before fleas, some are if you already have fleas, but we think all will help you. We have personally used all of the products on this list, we would only recommend the best. Disclosure: Some of the links above may be affiliate links, meaning at no additional cost to you, we earn a commission when you make a purchase through those links. Exercise: Dogs need a lot of exercise, even the one's who aren't very hyper! Exercise is very important to help build & keep a healthy immune system. We can help your dog exercise during the day when you're busy with work or family. Interaction: Your dog will meet tons of new dogs & people when they spend the day with us. Between our DayCare and boarding guests, we have a lot of friends for your dog to meet! We always start them out slowly, one-on-one, and if your dog does well we will move them up to a bigger group. If your dog doesn't like other dogs, don't fret! They will still receive plenty of interaction with our highly trained employees. Stimulation: Dogs, like people, need stimulation. Keeps their brain sharp, it's fun, & it helps them come home tired. Doggie DayCare provides constant stimulation, especially if your dog is used to napping during the day. Energy Release: More than anything else, we help your dog release their energy! With 5 acres & a pond, we have plenty of room & time to help your dog really run wild and do dog stuff with their doggie friends! Doggie DayCare at Francis Kennels is 6 AM-6 PM Monday-Saturday, no appointment necessary. You're welcome to pack your dogs breakfast/lunch/dinner if you'd like us to feed them during the day. We provide the bowls & toys. All are welcome at our DayCare, regardless of temperament, breed, or age. Your pup just needs to be up to date on their age appropriate vaccines & you're good to go! If you think Doggie DayCare is right for your dog, or you have more questions, give us a call at (937) 374-1636. You can also check out our Doggie DayCare information here. All new clients receive their first day of Doggie DayCare FREE! Will You Take a Short Survey for Us? We are hoping to add training services to our facility this year. We would love to hear your feedback! Thank you for taking the time to give us your opinion! We value & appreciate you! Meet Our Most Interesting Furry Guests! 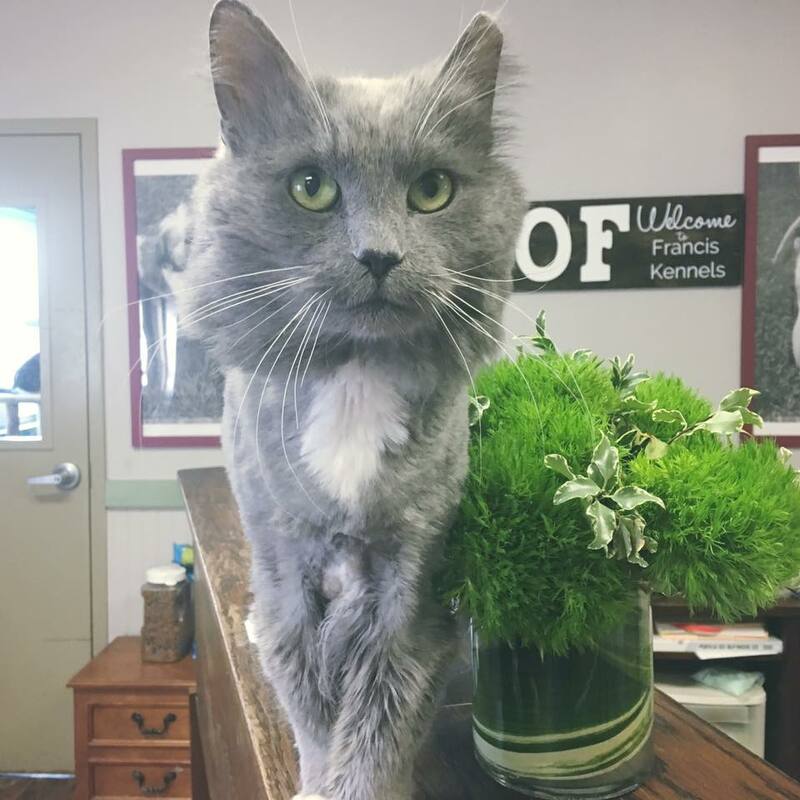 Adoptable Pet of the Month: Lenny! Meet Lenny! Lenny is a cool dude. He’s a handsome orange cat, and let me tell ya, he is ALL orange cat. The personality, spunkiness, & ‘tude they are known for, he’s got. He’s playful, happy, loves toys, loves attention, loves people. He would love another cat to play with, or older kids to keep him entertained. He’s even cool with dogs! Lenny came to us when his former owners left him & his K9 brother Louie behind when they moved. They left the poor boys outside but they didn’t leave their house they knew, hoping their people would come back for them. We took in both little guys, & Louie has found an awesome home. Now it’s Lenny’s turn! Lenny is around a year old, already neutered, vaccinated, & ready to go! If you are interested in adopting Lenny, please contact us at (937) 374-1636! It’s Adopt a Shelter Pet Day! We know they’ll have plenty of dogs & cats, hopefully one fits your needs! You may have already noticed that our Cat Room is looking a little different... That's because big things are happening! Our Cat Room is getting a TOTAL makeover! New paint, new kitty condos, maybe even some shiplap (cue our inner Joanna Gaines) :-) We're revamping this space to make it more comfortable for our guests & their parents, making it more relaxing, & even more fun! We have some big things planned so stay tuned for the final reveal! Bean is very excited for his new room!